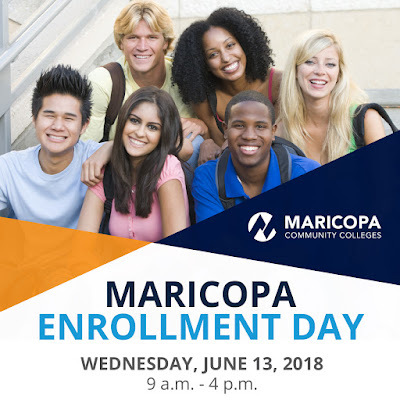 Rio Salado College | RioNews: Maricopa Enrollment Day is Wed., June 13! Maricopa Enrollment Day is Wed., June 13! What can you do on Enrollment Day? Register for classes. Payment is due immediately for Summer classes; Payment is due July 30 for Fall classes. Staff at the Rio Salado Tempe headquarters, Northen and Suprise locations will be available to help students complete their enrollment. Scottsdale Community College will host Enrollment Days Wednesday, June 13 and Thursday, June 14. To ensure proper service, please make sure to bring a photo ID (school/government issued: e.g., state ID, drivers license, permanent resident card, passport, etc.) Please also bring your Social Security number (alternate arrangements will be made for non-residents).